If you're with a group of gamers this is a perfect filler or something to play during the meal at the next game gathering! So, you think you know games? You are reading the latest magazines, going to the most recent conventions, and perusing the Boardgame Geek? then perhaps you and a partner are ready to take on your knowledgeable opponents at A Game of Games as teams compete to guess titles of games before their learned companions. The game is similar to Password, but all "words" are titles of board and card games. 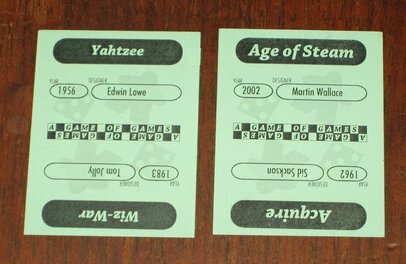 Players can score more points by knowing the designer and year of publication too. This game was given away at Alan Moon's Gathering of Friends in 2008. This version is identical except for the Gathering of Friends card that was included in the decks the attendees were given. It includes a deck of 50 cards (200 game titles) and rules for play.